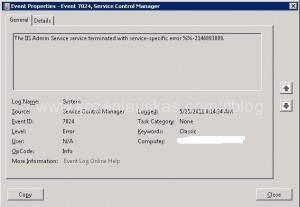 In the event viewer you should see error with Event ID 7024. 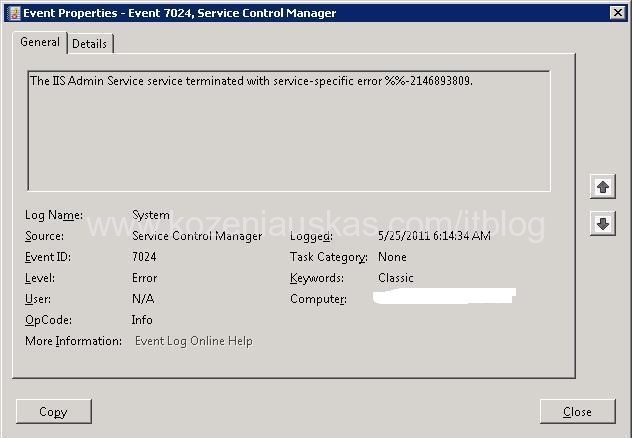 The IIS Admin Service service terminated with service-specific error %%-2146893809. Here is a possible fix. For the service to start it needs RSA MachineKey and access to it. The Key is stored in C:\Users\All Users\Application Data\Microsoft\Crypto\RSA\MachineKeys(for Server 2008) you should see some files in that location with the size of 2 or 3 Kbytes. Look for the file name that starts with ‘C23’. This is the key that is used by Microsoft Internet Information Server. Check the permissions on that key and make sure that ‘System’ and ‘Administrators’ have full control on this key. Once the permissions are set try starting IIS Admin service. Thank you so much! I was getting ready to jump from my office window over this error. Has this error and find your solution. Thanks, this solved the problem.